Years ago I began to draw my tiny drawings. I never thought of selling any of my micro doodles. I drew hundreds of them on paper, but never thought of putting them on canvas until 2000. When I first began to create my doodle boxes the canvas would chew up my pens. I use Koh-i-noor Rapidograph® pens and the tips are very fragile. I needed to paint on a smoother surface, so I painted a coating of paint on the canvas to make the pen glide easier. I found a phosphorecent blue paint that works wonders. It also lights my art up in the dark! After begining to doodle on my glowbox canvas's I couldn't stop. I use an array of different size pens to create a texture and mosaic of ink. Different images appear from various distances. 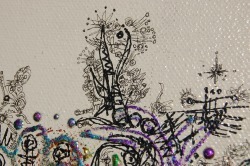 The scribbles draw the viewer in down to the surface of the canvas. Like the abstract surface of nature, my doodles attempt to capture the chaos in the world on a microscopic level. I am near sighted and use no magnification to do my art. I find the illustrations seem to draw themselves. In the sun I can let the pen take off and just go. I go into a sort of doodle trance. Music helps the pen flow. Nature helps the ink flow smoother. I like to use Rotring Rapidograph pens with a sealed ink cartridge. They are available from DickBlick.com. I also use Koh-i-noor, American made rapidograph pens. Also available from Blick. I use the 6x0, .13 size for my tiniest doodles! Check ebay for new unopened sets at marked down prices!